At the heart of any successful event is a team of fantastic vendors. Of the countless decisions our volunteers make each day, choosing the right vendors is one of the most important. While a small percentage of our vendors will be Direct Sale Marketers, our selection committee's intent is to provide the public with vendors who offer one-of-a-kind, hand-crafted, made in the USA merchandise. That is why we are restoring the time-honored tradition of having juried vendors at Victorian Days. We hope you enjoy shopping from these magnificent vendors this year. Larger fairs are usually juried and Victorian Days is not different. The jurying process involves sending in a portfolio that includes photos of your work and an application, along with the vendor fee. The selection committee will look over your photos and will then make their choice based on originality, creativity, marketability, general appeal, and quality of craft and booth design. The overwhelming majority of vendors will be artists, crafters, farmers, and small business owners. However, a very small percentage will also be direct sale marketers. There can only be one direct sale marketer per company. We ask that all vendors dress in a manner that supports the spirit of Victorian fashion. While some vendors do purchase reproduction Victorian outfits, some choose simpler adjustments; such as: wear a vest over a high-collared shirt; put knee socks over jeans or pants to look like knickers; attach feathers to a broad-brimmed hat and put on a pair of long, elbow length gloves; drape a shawl over a blouse or shirt; or try a top hat, a bowler or a fake handlebar mustache! The booth fees for this year's Victorian Days are: For Profit $145.00 / Non-Profit $90.00. Notice that vendors are not just renting table space, but are purchasing booth space. A booth space will be 10' x 10'. Vendors do provide their own tents, tables, and chairs. This year, we are not charging food vendors for their participation. However, we are requesting food vendors donate a portion of their gross proceeds to Belvidere Heritage, Inc., for the furtherance of our educational and heritage-preserving events. As many of our past retail and food vendors will tell you, it is a very rewarding experience to be selected as a vendor for Victorian Days. Check payments are only cashed upon approval, and at that time the vendor fee will become non-refundable. Upon receiving approval, most vendors rush to their workshop or commercial kitchen to begin producing items and menu plans! We look forward to reviewing your application. Please apply today to secure your spot in our selection process. 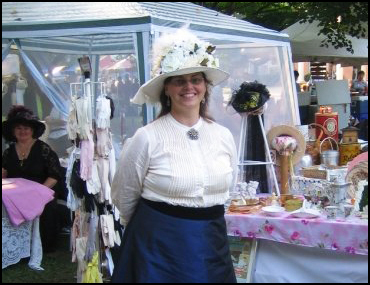 At this year's Victorian Days you will have the opportunity to shop from dozens of hand-selected, juried vendors who will provide you with a plethora of shopping opportunities. We are now accepting vendors for this year's Victorian Days celebration.